... navigate with us through the plenitude of requirements! With our support services, we will steward you in the implementation of material-related regulations and customer requirements, showing you a way out of the material compliance liability trap. To guarantee legal certainty, we strictly base our work on the state-of-the-art specifications of DIN EN 50581 and/or IEC 63000. As experts for material specifications, sustainable product design and hazmat management, we have been assisting our clients as fair consulting partners for many years. Our competence in material data communication was built up successfully in over 400 projects per year since 1999. You can benefit from our many years of practical experience, shared with you in our Material Compliance Academy. But our know-how also flows into the development of award-winning software solutions. Our satisfied clients come from SMEs as much as corporate structures. You will be provided with uncomplicated, tried and tested solutions for fast and economically compatible successes! Implement suitable processes and activities. That’s how you can reduce your personal and company risks. Raise your staff’s awareness and train them in our academy to build up your material compliance know-how. We research and evaluate the required declarations and material data of your suppliers on your behalf. 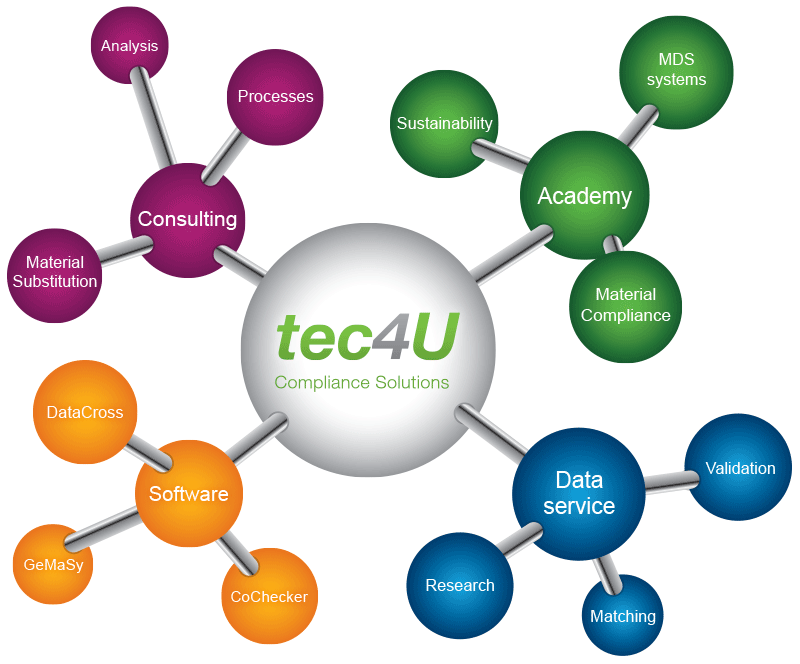 Rely on our material compliance system for efficient support in your supplier communication and data management.